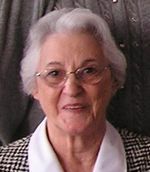 Mrs. Loretta Nari Ware, age 80, of McCaysville, Georgia, passed away September 13, 2011 at Erlanger Medical Center in Chattanooga, TN.Mrs.Ware was born in McCaysville, Georgia, to the late Anthony Nari and the late Eva Caver Nari. She was a lifelong resident of McCaysville and a member of the Williamstown United Methodist Church. Loretta was preceded in death by her parents; brother, Leonard Nari; sisters, Mattie Lou Gobble, Hilda Matthews, and Eileen Richards. Survivors include: husband, H. G. “Tommy” Ware of the home; son & daughter-in-law, Russell “Hugh” & Vicki Ware of Acworth, Georgia, daughter & husband, Jill & John Miracle of Rutherfordton, NC; sisters, Anna Lee Stepp of Blue Ridge, Georgia, and Evelyn Sisson of Isabella, Tennessee; grandchildren, Tracey & Master Sergeant Eric Fears USMC, Kristen Miracle, and Kaysie Miracle; great grandchildren, Cole & Marcella Fears. Funeral services: Friday, September 16, 2011at 2: P.M. from the Finch-Cochran Funeral Home Chapel with Rev. Carl Ware Jr., and Rev. Leslie Daniels officiating. Interment will follow in the Copper Ridge Memorial Gardens. The family will receive friends at the Finch-Cochran Funeral Home from 6:00 p.m. until 9:00 p.m. Thursday evening, September 15, 2011. In-lieu of flowers the family suggest that you may make a donation to the Williamstown United Methodist Church building fund. Arrangements entrusted to the Finch-Cochran Funeral Home of McCaysville, GA. You may send condolences to the family and sign the guest register at www.cochranfuneralhomes.com.